Getting into a car accident is not something most people want to think about, but it’s a risk that drivers face every day. For this reason, knowing what to do ahead of time will ensure that if that unfortunate time comes, you’ll be prepared. What we do immediately following a car accident could have an effect in three ways: ensuring your personal safety, documenting the accident and beginning the claims process. If anyone’s injured, get on the phone with emergency services or ask a bystander to call for help. If you’re able to, either on the side of the road or on a sidewalk. If your car is safe to drive and is causing a hazard where it is, pull it to the side of the road. Otherwise, leave it where it is and get yourself to safety. Turn off your engine, turn on your hazard lights and set road flares to warn other vehicles to slow down. Regardless of whether an accident is considered a minor fenderbender or a major collision, you may want to call the police. Even in small accidents, it’s important to have a police officer make an official report—and in some provinces, it’s legally required. In order to protect yourself, consider taking the following steps. Once the police arrive, get name(s) of all the responding officers. Ask the police officers present where you can obtain a copy of their accident report. -Document the accident thoroughly by taking snapshots from different angles, showing the damage done to both cars. Write down the names, addresses, phone numbers and insurance information of all individuals involved, including passengers. If there were any witnesses to the accident, take down their names and their contact information. 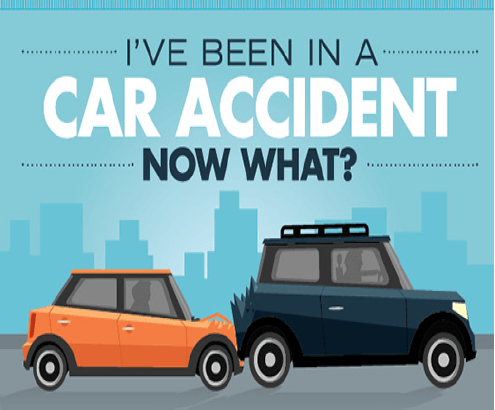 Having a car accident is unpleasant and can be downright frightening, but knowing what to do ahead of time can help to remove a little bit of the stress involved. And, make sure to keep a copy of your proof of insurance in your car.